I was recently contacted by a representative from Stonyfield Yogart. They asked me if I would like to do a review of their organic baby yogart. I have always been a fan of Stonyfield yogart because of my mom. She got me hooked on the original with the yummy cream on top. I enjoy eating it with fruit mixed in. It is a great option for breakfast or even a snack. The reason I first tried it was because I was having issues with yeast infections and my doctor told me to eat yogart that has active cultures in it called Probiotics. Probiotics are beneficial bacteria that live in our digestive tract. The yogart contains just enough to help replenish what is lost due to many different factors such as antibiotics, poor nutrition, stress (that’s me – LOL), pollution, and aging. Each serving of Stonyfield yogart contains five billion natural probiotic cultures. I was given several great coupons as well as 2 FREE coupons for the Stonyfield YoBaby Yogart which is what I will be reviewing in this post. Each pack comes with 6 – 4 oz. containers (perfect size for baby). They have several flavor options: Original, Apple, Banana, Blueberry, Peach, Pear, and Vanilla. I gave the yogart to my children for breakfast one morning and they loved it. My daughter (3) asked for a second one. 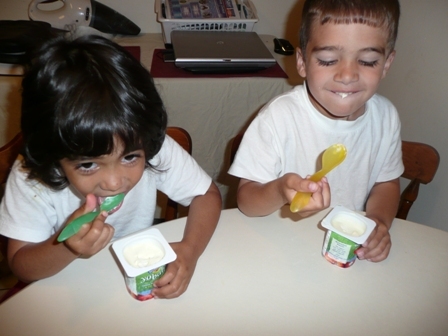 Here is a picture of them enjoying their new yogart. I have to admit that I also tried one and loved it too. I love the fact that it is not overly sweet. So many of the children’s yogart out on the market today is FULL of sugar and WAY too sweet. The funny thing is, I didn’t realize until researching what I was going to write for this post that the Yobaby yogart can actually be given to a baby as early as 6 months. Wow! I have an 8 month old and wasn’t sure if it was ok to give him – and now I know! 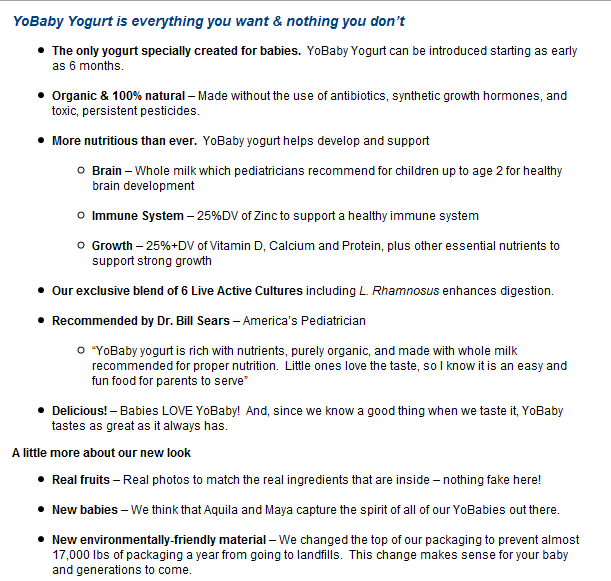 So, if you are thinking about introducing a dairy into your baby’s diet, definitely start with Stonyfield YoBaby Yogart! I love Yo Baby Yogurt and Stonyfield. I just watched Food, Inc. and saw Gary Hirshberg (Stonyfield owner) discuss how they came to be and how they are getting their organics into stores everywhere. Good to know moms have better options on the shelves. .-= Sugar Jones´s last blog ..The Dish on Food, Inc. =-.